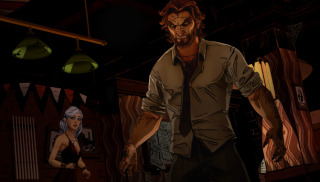 Telltale's adaptation of comic Fables will be unleashing Grimm-dark fantasy noir from this Friday. Today's slightly premature launch trailer introduces you to lead character Bigsby, who is simultaneously a wolf, a sheriff, and a nemesis of pigs. As you'll see from the trailer, Telltale are drawing heavily from The Walking Dead's winning formula, promising choice, consequence, and cartoon scowls. Available now as a full season pre-order , the game will follow an episodic format, with five episodes planned in total. The first episode is titled Faith, and it will be followed by Smoke and Mirrors, A Crooked Mile, In Sheep's Clothing and Cry Wolf. Only two terrible wolf puns? I admire that restraint.